This article is dedicated to the memory of Václav Havel, who died on 18 December 2011, the first post-communist president of Czechoslovakia and its successor country of Czechia, a most prominent freedom fighter during the dark decades of communist dictatorship in Eastern Europe. Havel has been for many of us, especially those who lived behind the Iron Curtain, a beckon of hope with his ever inspiring principled attitude and actions, often enduring prison terms for opposing the communist ideology and regimentation of the society. Havel was equally an intellectual of highest calibre and creator of literary masterpieces, an authentic product of his country’s sophisticated and rich heritage. He was also closely linked with the world of architecture through the work of his grandfather, Vácslav Havel, one of the architects of Lucerna Palace, the first commercial and cultural complex of Prague, an innovative design built at the beginning of the c20th. A cutting edge innovation of that period was the Czech cubist architecture, unique to that country. It represents one of the most original historic forms of architectural expression in Europe, which unfurled during the 1910s, for just a few short years preceding the Great War. The proponents of Czech cubism were part of a group that admired the creations of Picasso and Braque, which included creators from different artistic fields, among them the painter and writer Josef Čapek who introduced the word “robot” for human-like machines. They realised the pivotal importance of Picasso’s and other great artists of cubism’s work and ideas in exposing the elemental essence of their subjects through representations of straight lines and figures, as revealed by both latest scientific discoveries of the industrial era, and artistic products of the “primitive” communities from Africa or Oceania. The architects belonging to that group, people like Josef Gočár, Vlastislav Hofman or Josef Chochol, endeavoured to infuse those ideas in their designs by means of crystal-like outlines and facets applied to the overall building architecture, reducing and unifying as many elements as possible to an envisaged primordial cubist state. They in fact, by applying the principles of cubism, wonderfully prefigured in an novel way, the global Art Deco and Modernist styles of the inter-war period or even, I venture to say, the deconstructivism of the late c20th. The legacy of Czech cubism continued in the years between the world wars through an equally fascinating offshot named Rondocubism, that combined cubism with Czech ethnographic motifs, an order also termed as the Czech national architectural style. The images bellow illustrate one of the cubist houses of Prague, designed by architect Josef Chochol, located at the base of Vysehrad hill, on the river Vltava’s Rasin Embankment. The edifice was built in 1912 – ’13, being the earliest cubist project of Chochol. The photographs were provided by Daniela Oana Gagu, a reader of my blog and good friend, who works and lives in Prague. 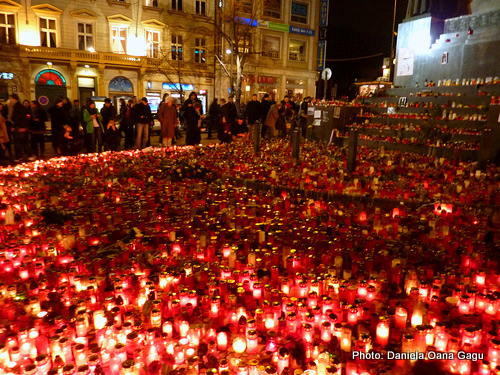 Oana has also witnessed and went through the collective grief with the occasion of Vaclav Havel’s death, furthermore sending the evocative image, presented above, with the vigil outside Hrad Cathedral for that great personality of Czech and European history. Chochol abundantly uses crystal-like shapes in modelling the different architectural elements making up the edifice. I can sense that he tries to organically integrate the cubist forms as completely as possible within the overall architectural design of the house, although remnants of the old styles are easily detectable, such as baroque echoes seen in the elevated roof or central pediment. The basrelief embellishing the polygonal pediment is a later addition, representing national legends connected with Vysehrad castle. Remarkable is also the cubist style ironwork of the balcony. Above is one of the side façades where the crystal-like motifs and shapes come together even more expressively, afforded by their higher density, giving the impression of spilling over into the street through the interesting cubist design of the gate poles. The Czech cubist architecture was not only limited to the architecture of the exterior, but envisioned to encompass as much as possible of the habitable space, as can be learned from the plan of this house, going as far as to the minute design of furniture and day to day objects. It anticipated something of a “cubist way of life”, in tone with the high hopes of the modern industrial society of that time, which was so thoroughly shattered not long after by the conflagration of the Great War.